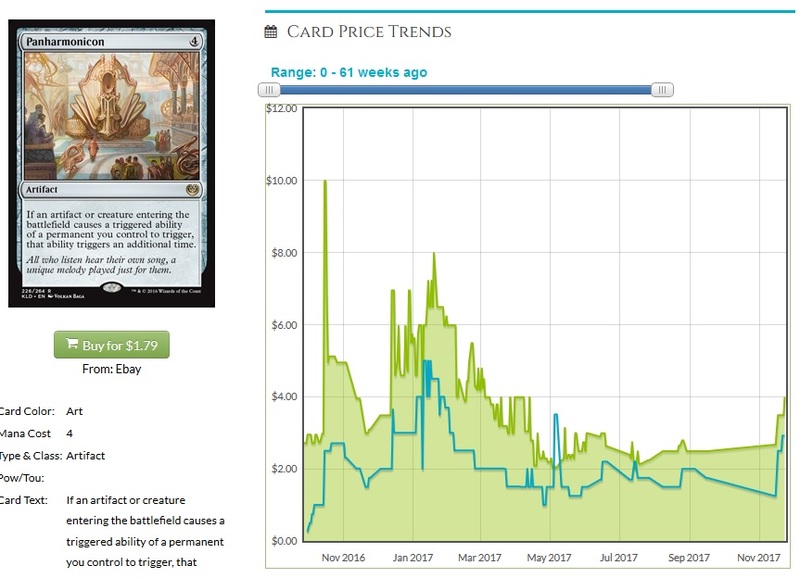 There’s a lot of reasons why Amonkhet prices are falling as fast as they are, from Invocations to peak supply to a lack of new toys to play with, considering we’re about to get all of Hour of Devastation and we know a lot about Ixalan already. 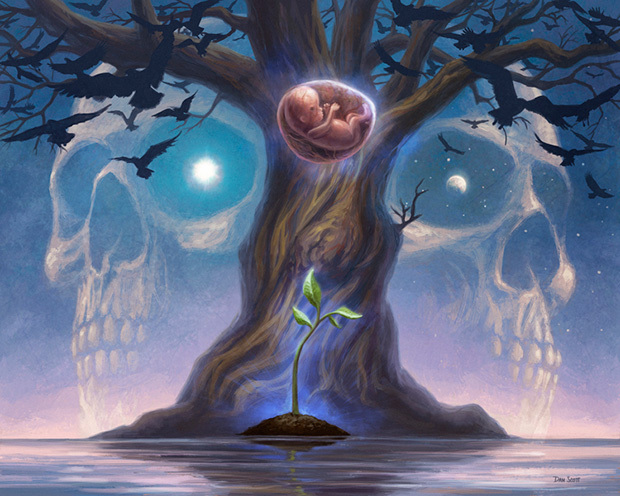 With the Hour upon us, and prereleases next weekend, it’s time to take a look at the trajectories of some of these cards and see where they have to go. 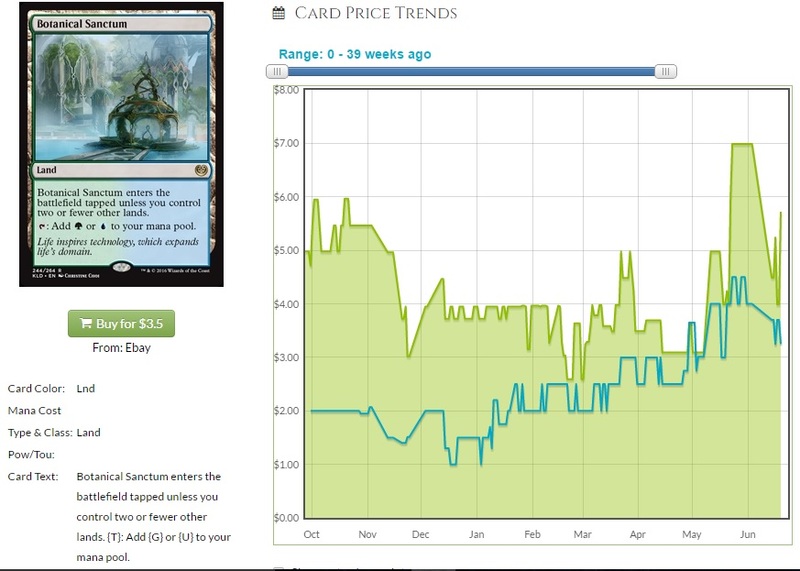 There are still packs of Amonkhet being opened, and while that’s going to exert some downward pressure, the historical data tells us that most prices won’t fall too much further. Want some examples? Sure. Let’s start with a rollercoaster of a card: Panharmonicon. 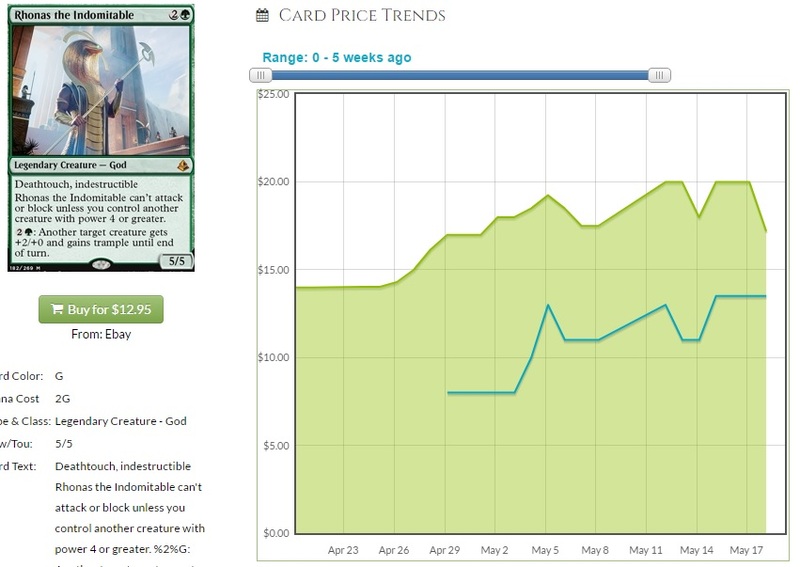 So it spiked to $10 right away as people tried brewing midrangey value decks with it, and those were sweet. They were not winners, and Panharmonicon had been trickling down ever since. I didn’t highlight when Aether Revolt came out. Looking at the graph, can you tell when it did? Maybe you know release dates off the top of your head. How about something more basic? Botanical Sanctum. You already know when the second set came out, and you can see how the price barely moved. The demand was pretty steady, until pretty recently when everyone figured out that Marvel was the best deck, and now it’s banned. 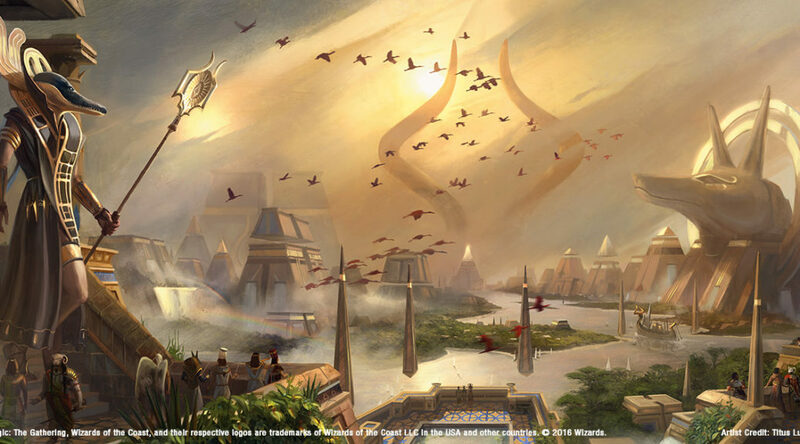 With this data in mind, let’s look at some Amonkhet cards and see where they might be going. Rhonas the Indomitable ($13 nonfoil/$23 foil/$52 Invocation) – What’s interesting is how little play this is currently seeing in Standard. It’s become a spicy one-of in assorted Collected Company decks in Modern, as a powerful attacker and also another way to use infinite mana if you haven’t drawn the Duskwatch Recruiter. If something comes along to make it good, it’ll spike (generically useful advice!) but barring that, this will continue to trickle downwards and will likely end up at $10 or so. Gideon of the Trials ($12/$24) – Oh how the mighty have fallen. This was preordering for $40! I hope you’re not preordering anything from Hour of Devastation. Just don’t do it. Haven’t you learned? That’ll be its own article soon. 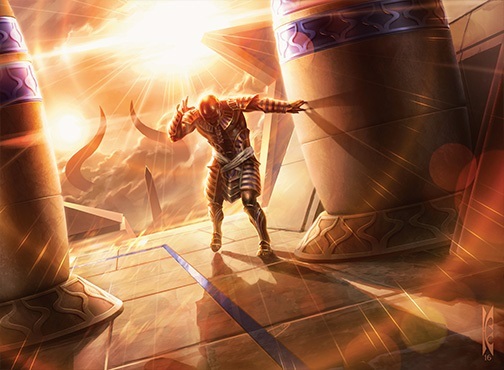 Anyway, Gideon v6 (I’m counting Kytheon, Hero of Akros) was heralded as an unstoppable force in Legacy, as a combo enabler in Modern, and as a three-mana planeswalker, shouldn’t be underestimated in Standard. He’s played mostly in Modern now and is making no waves in Standard at this time. He’s going to end up at $8 or less, and hopefully you’ve learned your lesson. Vizier of the Menagerie ($6/$16) – No one is trying to make this work in any constructed format. This is a casual card, all the way. It started out at $10, and hasn’t fallen very far, and that’s mainly because this is an auto-include in almost any green Commander deck, and that’s absorbing the supply at a pretty good pace. I actually don’t think this will fall any farther, and it’ll stay stable until we get to Ixalan, at which point it might even start trending upwards. Glorybringer ($4/$10) – You’d be impressed at the number of big hasty beaters who have never had a big price. Thundermaw Hellkite. Stormbreath Dragon. Either version of Kolaghan. And so on. This was $10 at first but the price has stabilized, and I don’t think it’ll go any lower. A pickup of this at $4 (or less!) is a decent one, but I’m not going to get too happy or too deep. Not many decks will seek to run a full four of these. Sweltering Suns ($4/$6) – Yeah, take a look at that foil multiplier. 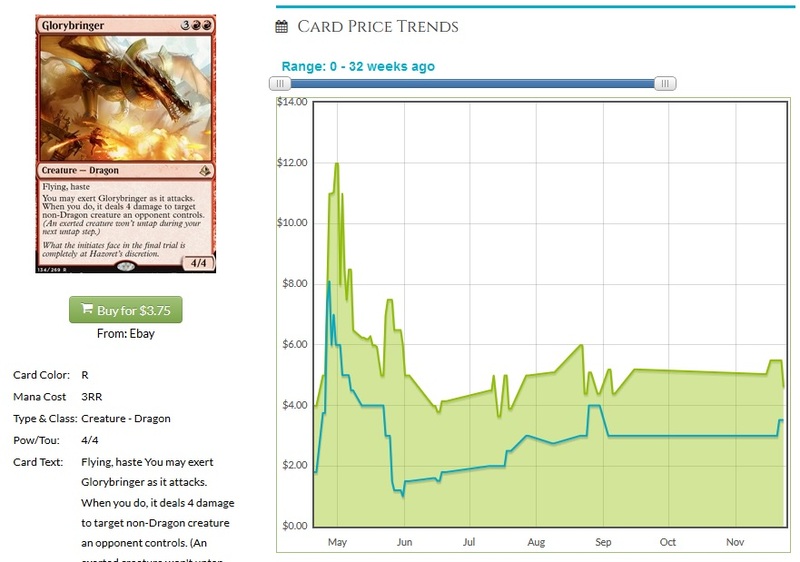 I can’t recall the last time foils and nonfoils of a rare were that close in price, but here we are. The card is showing up in a lot of sideboards in Standard, and it’s a fun card to put in your UR control deck. The extra spicy tech in that deck is how Thing in the Ice is going to come down anyway, and live through the Suns. Nothing telegraphs a sweeper like refusing to play a creature into it. 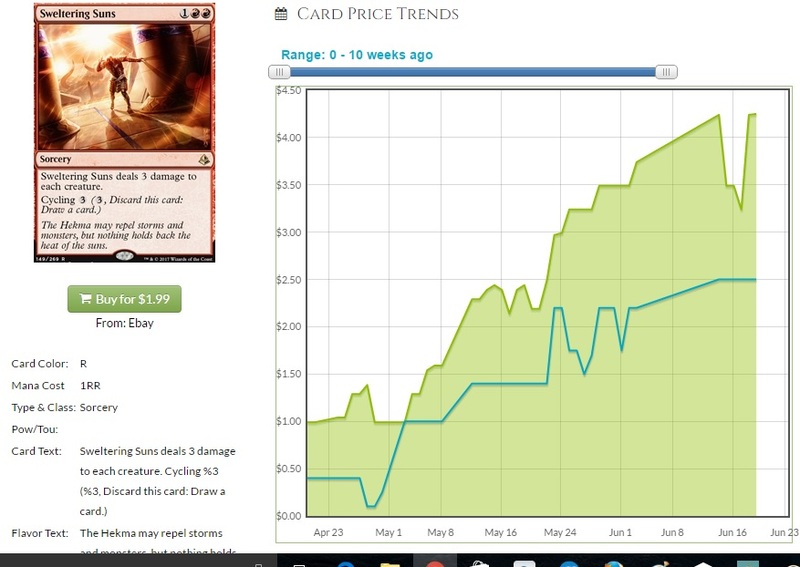 It’s not common for us to see a card slowly rise like this over time. Usually, we see spikes as someone figures it out and does well, but this is getting play here, and there, and in this sideboard, and it’s possibly better in Modern than Anger of the Gods (you want cycling or you want exile, take your pick) but it’s a card that is a good contender to keep going up. Three damage is enough to kill almost everything played before turn three, and if you can get the double red, it’s hard for this to not get at least two creatures. And it cycles! I’m not advocating buying Sweltering Suns right now. It’d have to go up in price tremendously to be worth it. I would, however, trade for them slowly and hold onto them for a while, because it’s going to be climbing more. Cliff is an avid Cuber these days, having played far too many Commander games that lasted two hours. He first opened a pack of Revised in late 1994, and has been writing about Magic for longer than he’s been a father. He’s always on the lookout for value or weird ways to play. Oh do I love the beginning of a set. Prereleases are among the purest tournaments to me, because I don’t know the tricks, the angles, the basics of what to be afraid of. There’s synergies to explore and so much to experience! I don’t like picking Standard cards when there’s a banning announcement coming so soon, but there’s already some stuff that I’ve noticed and want to trade for soon. 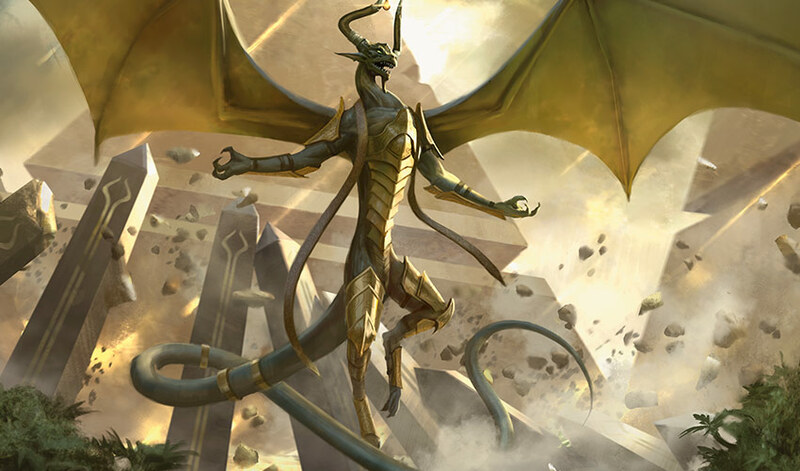 A couple of caveats: First of all, my standing advice remains good: Trade away everything you open at the prerelease, and trade for anything that isn’t in Amonkhet. There’s going to be a big loss in almost all the prices, and picking the one or two cards that go up from here isn’t worth it. Assume it’s all going to lose value, and trade accordingly. Second, about the price drops: The value loss is going to be real and big and significant. I’m going to give you my price targets, the value that I’m hoping these fall to before I start picking them up in earnest. 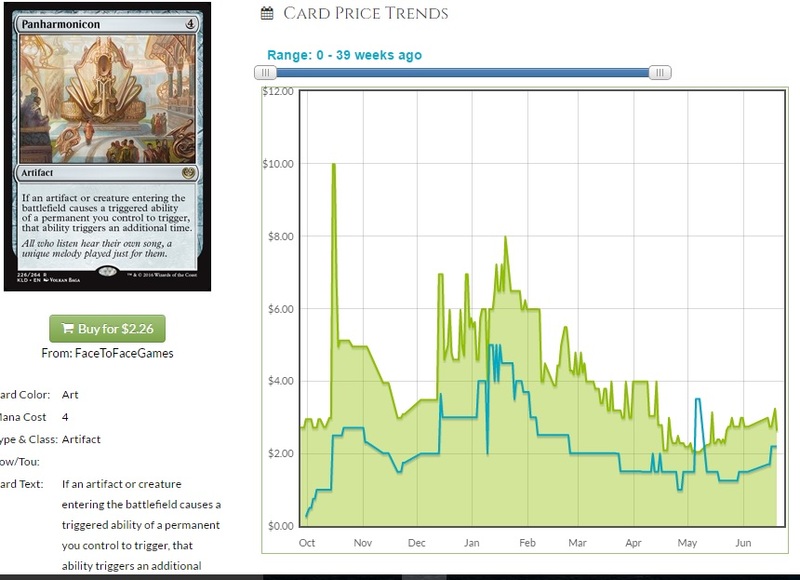 Panharmonicon never fell to the dollar rare I was hoping for, but Lifecrafter’s Bestiary is surely there. I’m going to list the prices that we currently have for these cards, but with this still being in pre-order mode, these prices reflect what stores want to get for them.